There was quite a bit of buzz about the N9 last week, including a lot of gadget lust for the device. There’s a lot of love out there for Nokia yet, and the N9 is a handset to bring this out. Amid the inevitable questions about what could have been if Nokia had stayed with MeeGo as a part of its portfolio, there were even showings of hope that the relegation of MeeGo to a research project wasn’t final. A twitter petition was started and even the occasional blog post proclaiming a change of heart on the part of Steven Elop were written. Of course this is nonsense. Even a huge success of the N9 would not change anything at Nokia, not with the current management in place. And then, of course, there is the unfortunate fact that the N9 will not be a success. While some of the reactions to the N9 really were ecstatic, there is no telling how much even of that will keep until the actual release sometime in the fall. 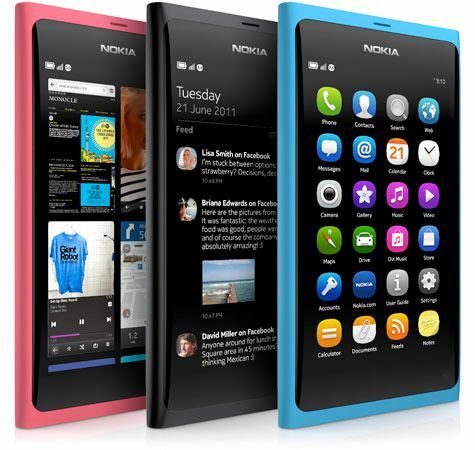 The hardware of the N9 certainly looks gorgeous. Colorful yet simple, with a nicely curved screen, it is something to be desired, and feels at place among the current high-end phones. Once you dig underneath, however, it comes from the same family of SoCs that powered the N900 – which was announced 22 months ago. High-end hardware back then, but now outdated in this segment. Even worse is that performance upgrades can only come from switching to a newer line of SoCs, which needs new OS adaptations under the hood. A reason for using this SoC is that the core OS is the follow-up to Maemo 5, which powered the N900 – and which was canned at the beginning of 2010 when Nokia announced the cooperation with Intel on MeeGo. There’s Qt on top, which as a cross-platform toolkit was developed independently of Maemo and MeeGo, and thus probably not as affected by the recent changes. The entire thing is not fully MeeGo compliant. This strongly indicates that MeeGo was, as a matter of fact, not close to launch-ready, since it was apparently easier to go back to a software/hardware combination from early 2010 than to finish anything currently in development. It also indicates support for current top-end hardware is nowhere there yet. Thought experiments about reviving MeeGo not only have to take this into consideration, but also that a considerable amount of the development team has left for other companies. Rebuilding the team, and then continuing a product that was further from launch than software abandoned over a year ago – well, it’s hard to see a product launch there before the first WP 7 devices. So the N9 does not clearly demonstrate tech leadership on the part of Nokia, as some would have it, but instead speaks of delays and execution problems – once again. Now users aren’t interested in OSes and only peripherally aware of release schedules. Functionality and ecosystem are what matters to them. The functionality of the N9 out of the box is certainly impressive. All the basics are covered, there is deep integration of social networks, and Nokia Maps on the N9 could well turn out to be the best satnav experience on a smartphone yet. There is even Angry Birds (which was also available for the N900, so this is not that surprising). Beyond that, once you need an ecosystem to extend this functionality, things aren’t looking so good. There is a small dedicated developer community around the Maemo devices, but the main repository currently only lists 657 applications. A lot of these are going to make it onto the N9, but neither is that an impressive number, nor do most of these have mainstream appeal in their funcionality or UI. Qt as the development toolkit eases porting of newer Symbian applications, and, to be fair, the apps situation there has improved a lot, but again the question is how many developers are actually going to bother to adapt their applications for a single device. Alien Dalvik is seen as a trump card to solve the application problems by many. It allows Android applications to run on the N9, so potentially the entire Android application catalogue could run on the N9. Aside the point that this is not true for anything that runs native code (read: at least all games that use computing-intensive graphics), this again requires some developer effort in repackaging their applications. This is not going to happen for the vast majority of the applications, not for a single device. Add to that the problem of discovery, installation and payment absent a central marketplace, and the trump card turns into a dud for mainstream users. Nobody’s willing to hunt the web for install files anymore, or to pay on developer’s websites. What about the UI, which has gotten people so excited? Could this play a role? It’s certainly different, it’s fluid, it has interesting ideas. The same was true for webOS. Palm bet the company on it, lost big time, and is now part of HP. So no, the best UI in the world can’t bring about the success of a smartphone in the current market, not without an ecosystem around it. I guess he needn’t worry much about a sales success that would call this decision into question. Nice hardware, with a spec sheet that will be even less stunning by the time the N9 is in shops among a slew of dual-core top-end phones, and with a non-existent ecosystem is unlikely to attract much more than the Linux enthusiasts and Nokia fans who bought the N900. For them the 91,000 units, which Eldar Mutartzin has claimed are the entire production run for the N9, might suffice. It is certainly believable that with no real commitment behind the launch, there are no plans for producing more than a token amount. Which brings us to the why the N9 was launched at all. The situation here looks murky at best, with several theories out there. Following the February announcement there were stories that Nokia is contractually obliged to Intel to produce a MeeGo device this year. It is hard to see how a device running on Texas Instruments ARM hardware could benefit Intel directly, but it’s possible they insisted, either to spite Nokia or to get some affordable developer hardware capable of running MeeGo out there. In case of the latter, they might also be willing to accept this as the obligation fulfilled, since it otherwise they could well argue that this is not, in fact, a MeeGo device. Another line of reasoning has fractions within Nokia still pushing for MeeGo, and the N9 as their baby. I have no idea whether anybody would actually have the pull, e.g. through connections to the board, to get this launched against the resistance of the upper management, but I strongly doubt it. But then the new management might have found the release to be useful as well, to demonstrate to the world, through its failure in the market, that choosing WP7 over MeeGo was the right decision. The leak of the WP7 video lends a little credence to this theory . Maybe that there are fractions that want this to succeed, and ones that are actively working against this. Finally, there is the possibility that it is really just there to test some concepts, and as developer hardware for MeeGo as a skunkworks project. The design of the casing, after all, will be reused for the first WP7 device, and there’s even talk of reusing the interface at some point in the future, so the extra work might have been acceptable for this. Whatever the reason for its launch, in the end it doesn’t matter: It is clear that the N9 is the last device to truly represent Nokia as an integrated hardware and software company – at once intriguing, beautiful, and doomed. It is the last of the Nokians – and despite, or maybe because of this, I want one. In black, as a beautiful memento of the Nokia that ended on February 11th 2010.